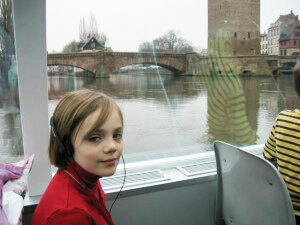 Families sightseeing in Europe have different priorities than couples or individuals. The adults still want to visit historic sites, experience a different culture, try new foods and drinks, but kids get impatient with complex itineraries and long waits. A visit can’t just be interesting –- it also has to be fun. 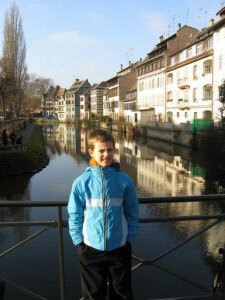 Strasbourg was a treat for our family of four with two kids, ages 7 and 9. We visited in December to see the famous Christmas markets and discovered an impressive city that makes it easy for young visitors to enjoy its charms. Strasbourg, France, a city of over 700,000 thousand in Northeastern France is part of Alsace, a region that has belonged to both Germany and France over the years. This vibrant symbol of European unity (it is the headquarters for the Council of Europe, the European Parliament, and the European Court and Commission for Human Rights) has a complex and fascinating history, and the blend of French and German architecture, cuisine, and language makes Strasbourg very different from other French cities. Strasbourg doesn’t hide its goodies; the picturesque river with its many bridges, its breathtakingly beautiful cathedral, and its fairytale houses are all there to be enjoyed by the wandering visitor. There is an appealing coziness to old Strasbourg, whether you are strolling through its winding streets amidst the leaning wattle and daub houses, or enjoying a meal in one of the weinstubs decorated in wood and warm Alsatian fabrics. 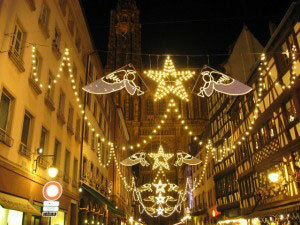 Winter is a fabulous time to enjoy Strasbourg’s coziness. 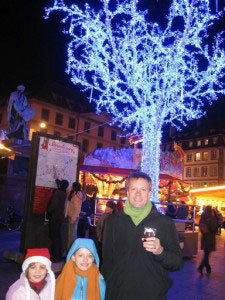 The Christmas markets that run from the end of November through December 24th are perhaps the best in France. These outdoor markets sell hot spiced red wine (spiced cider or orange juice for the kids), pretzels, crepes, and cakes, as well as crafts and inexpensive Christmas items. Our daughter entered into the spirit of the season by using her pocket money to buy a Santa hat with braids. 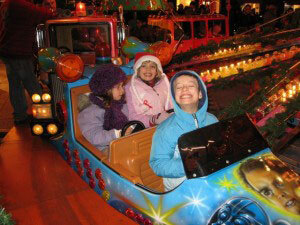 While the markets contribute to the festive air of Strasbourg at Christmastime, they were not the main attraction for our family. It was this charming city and its many year-round attractions that we found so captivating. Boat tour of the city - To get oriented, start your visit with an hour and 10-minute boat ride on the Ill River. Listening to the children's audio guide on a boat ride of the Ill river. If you’re familiar with the touristy Bateaux Mouche boat rides in Paris, you might decide to skip this trip. Don’t. This was one of the highlights of our trip -- relaxing, informative, and enjoyed by the whole family. The boat is comfortable (well-heated in winter) with good visibility. An audio presentation in English is available in both adult and kids’ versions. Presented in the form of a story of a pirate learning about the history of Strasbourg, the kids’ audio guide gave our seven-year-old a lot to talk about as we walked along the waterfront promenade afterward. Building began in 1015 and the spire was completed in 1439. The kids can burn off some energy (and their parents the heavy Alsatian meals) by climbing the 330 steps to the base of the spire. From the cathedral platform, you can enjoy the view of the city and beyond in all directions. Open April-Sept. 9:00 – 7:30; Oct.-March 10:00 – 5:30; June-August open til 10 pm every Friday and Saturday. The Petite France district, a short walk from the center, is a charming neighborhood of half-timber gingerbread houses that will make you feel like you are in a fairytale. Wander the little streets and the waterfront promenade with the kids and then find the park along the waterfront surrounded on two sides by water where our kids enjoyed swinging and climbing. The Musée Alsacien is devoted to explaining rural life in Alsace in the 18th and 19th centuries and contains religious and secular images typical of the region, including clothing, furniture, ceramics, and toys. Reconstructions of interiors characteristic of the different regions of Alsace as well as artisans’ workshops can be found throughout the museum. Orangerie - Situated in front of the Palace of Europe, this is the largest and oldest park in the city. The stork, the symbol of Strasbourg, was successfully reintroduced at this park and can be seen all times of the year. Kids love the park’s many play areas, the miniature farm, and zoo (no entry charge). The park also has a lake with boat rentals. The park is open 24 hours. The zoo is open 10 – 6 daily. If the kids get hungry outside of regular mealtimes, try one of the informal brasseries found throughout the city. Perhaps because of the German influence, meal times seem to be earlier than in most French cities, and we found it easy to dine before 7:00 pm. Le Clou - Open every day except Sunday for lunch and early or late dinner. This friendly weinstub (bistro) serving local dishes is deservedly popular, so be sure to book in advance. English is spoken. Maison Kammerzell - This restaurant is well known for its setting in a richly carved, half-timber 15th-century building. 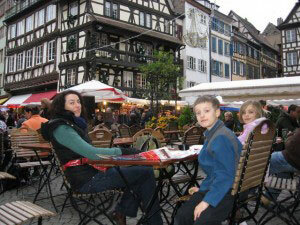 It sits on the wide plaza in front of the old cathedral in the center of Strasbourg’s old city. They serve various Alsatian dishes and wines. The restaurant is popular as a great place to have a meal while watching the street performers and various other characters wandering around the area. Strissel - This rustic and cozy restaurant serves excellent choucroute. In the heart of the Petite France neighborhood, Hotel Regent Petite France is a luxury hotel whose rooms have stunning views of the River Ill. In addition to standard rooms, it also has suites and duplexes to accommodate larger families. Rates for rooms and suites range in price from 200—300 euros. Hotel Dragon is in a central location just across from the Petite France neighborhood. The three-star hotel has a charming patio garden and family suites for 3 to 5 people from 159 to 187 euros. Hotel Gutenberg is a two-star hotel with old Alsatian charm in a central location. 98 -113 euros for a family room that sleeps up to four persons. Alexandra Regan is taking a year off from her life in Corvallis, Oregon, to live in Dijon, France, with her family. Puerto Vallarta: Bring the Kids!